The tradition over the years. 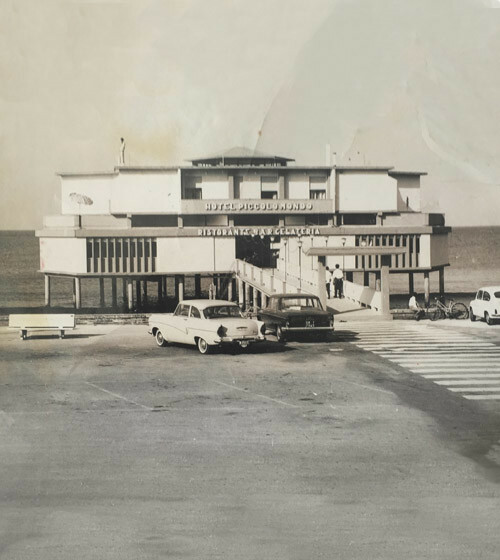 It is on June 24th, 1962 that the Piccolo Mondo opened its doors for the very first time. From then on, began an adventure that has been lasting for more than 50 years. The idea came from the patriarch of the family Passini, Aladino, who remembered that, on that very jetty, once came and went ships involved in the traffic of the Leopolda Foundry, which has been at the base of the development of the city, until the outbreak of World War II. This time though, that jetty was to attract tourists and locals as an hotel restaurant. To the astonishment and disbelief of their fellow citizens, in less than six months, the construction of the Piccolo Mondo had ended. Since then, the establishment has been blooming, run by his son Marcello, by the wife of the latter, as well as their children. Heart sank, an unforgettable experience. The environment is refined, elegant while retaining the characteristic of familiarity. In fact, every client becomes a friend. creating a friendly environment where the look prince is just hospitality.